We offer the best quality Clean Agent Fire Extinguisher for the clients. Clean Agent Fire Extinguisher that we offer is also known as HFC Blend A. Our Clean Agent Fire Extinguisher stores liquids which turn into gas when comes in contact with fires and fight against fires by cooling and smothering it. Clean Agent Fire Extinguisher, provided by us, is effective on Class A, B, and C fires without making thermal shock to delicate electronic equipment. Clean Agent Fire Extinguisher, we offer, is EPA approved and has Zero ozone depletion potential. 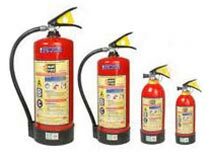 Clean Agent Fire Extinguisher are available in weights of 1, 2, 4 & 6 Kg.